The Office of Arts & Culture (ARTS) and Seattle Center (SC) are seeking artists to develop temporary artworks for the 2017 Poetry Garden on the Seattle Center. The theme for this year’s series of artworks is Seattle Center Festál Turns 20. Festál presents world festivals throughout the year highlighting the distinct cultures and common threads of ethnic communities in our region through traditional and contemporary art, music, foods, youth activities, workshops and more. For the 20th year of Festál, ARTS is seeking artists to create artworks that embody and celebrate the richness of the cultural festivals. Artworks can respond to one or several of the 24 Festál festivals or cultures. The artwork should also respond to the site of the Poetry Garden in its design and approach. If you are interested in being considered for this project, please submit a concept proposal (not to exceed 2,000 characters) specific to the scope of work (listed below). The concept proposal should be a paragraph or more to convey an artist’s idea to someone for review and evaluation. The proposal must convey his/her ideas in a clear and exciting way. The Office of Arts & Culture and the Seattle Center have a 40-year history of partnering to bring permanent and temporary artworks to the Seattle Center campus. In 2015, ARTS and SC jointly invested in emerging artists by providing training and commissioning seven emerging artists to create a site specific temporary artwork for the campus. The 2016 Poetry Garden Series is a continuation of this investment. The Poetry Garden was envisioned at its inception to be a site for temporary art activations. In 2015, Seattle Center constructed a five-panel grid that is 8’ x 8’, with the center 6’ x 6’ section in one-foot squares that provides a structure for temporary installations. The fence, newly built in 2015, provides an opportunity for artists and poets to create two- or three-dimensional suspended or affixed artworks within the garden. In 2006, the Poetry Garden was created in the heart of the Seattle Center campus, on 3rd Ave N., west of the Seattle Center Armory building. The small garden is composed of crushed granite paths punctuated by 12 sculpted, polished, pink granite boulders engraved with an eclectic selection of poems by various authors. The boulders were sculpted and sited by artist/sculptor John Hoge. The entire site is shaded by a high tree canopy of London Plane and Zelcova trees. Curving seat walls define the inner edges of the beds of shade loving plants. A relatively unknown and rare tree in Seattle, the Medlar, grows on the west edge of the garden. The fence grid marks the west edge of the garden. Built for the 1962 World's Fair, the 74-acre Seattle Center campus is located just north of downtown Seattle and is home to more than 30 arts, entertainment and educational organizations. It offers open space, several outstanding visitor destinations and a year-round place for community, cultural and commercial activities, live touring shows, and family activities. The purpose of Seattle Center is to create exceptional events, experiences and environments that delight and inspire the human spirit to build stronger communities. Visit the Seattle Center website to learn how the campus is a hub for cultural and artistic pursuits. Seattle Center Festál is a series of 24 free annual ethnic cultural events that take place on the grounds of Seattle Center in Seattle, Washington. A major cultural program of the City, Festál aims to celebrate and connect the broader public to its varied global ethnic communities. These festivals, produced by organizations that emerge from the communities they represent, contain various arts performances (dance, visual arts, music, film), community dances, marketplaces, ethnic foods, educational and hands-on activities and other offerings, making Seattle Center campus their space for a time. In 2017, Festál will celebrate 20 years at Seattle Center. Seattle Center’s Festál showcases events that promote the cultural and ethnic traditions of our heritages, for the enjoyment and enlightenment of all people in the larger community. The purpose of Festál is to provide opportunities for ethnic communities to produce and present enriching, non-political, non-religious celebrations at Seattle Center and to showcase those celebrations to include all people of the region in order to promote understanding, nurture the human spirit in each person, and bring us together as a rich and varied community. Seattle Center, as the cultural and community heart of the city, is committed to being the nation’s best gathering place inclusive of all people. This call is open to emerging public artists living in Washington state. The Office of Arts & Culture defines emerging public artists as artists who have a documented track record of making art, are interested in creating art in public places, and may or may not have a formal art education. Applicants must be over 18 years old and interested in working collaboratively in public settings. Applicants are not eligible if they have received a permanently sited public or private art commission of more than $10,000. The Office of Arts & Culture is committed to reflecting the cultural richness of our city by promoting opportunities for emerging and diverse artists. 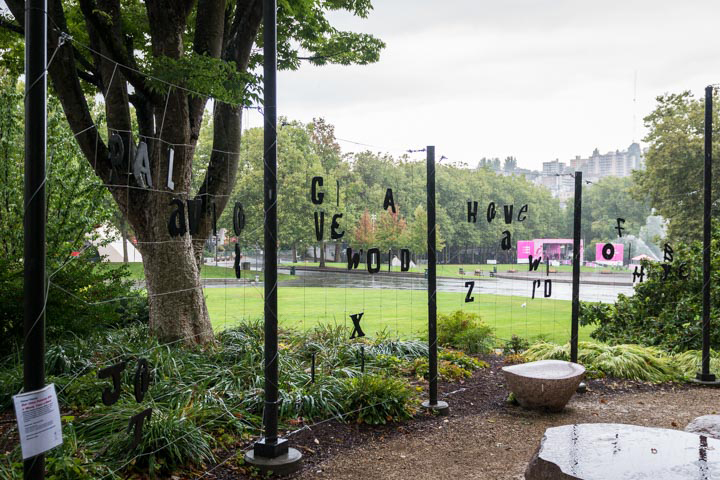 Working with Seattle Center and the Office of Arts & Culture, four selected artists will design and develop small-scale temporary artworks to be installed on the Poetry garden fence, (e.g., printed vinyl, wood, works on canvas, etc.) for three-month periods in 2017 on the Seattle Center campus. Artists are encouraged to be creative with materials; artworks that intentionally deteriorate over time will be considered for this project. The artworks should not cause damage to property but should be secured in a way that considers prevention of theft or vandalism. Each selected artist will receive $1,000, inclusive of all fees, including Washington State Sales and Use Tax (9.6%.) Artists will receive 40 percent of the total commission upon acceptance of the final artwork proposal, 40 percent after documented installation of the artwork, and the remaining 20 percent after documented de-installation of artwork, photo documentation and a brief project summary have been delivered. 2017 Poetry Garden Series is commissioned and administered by the Office of Arts & Culture. Eight (8) images of past artworks. You may use ONE slide as a loose sketch for your concept proposal. This is not required and the panel will solely base their decision on written proposals and the strength of past artworks. CaFÉTM image format instructions can be found at image prep. If you have fewer than eight quality images, you will need to insert a detail of one of your images or a blank slide. Concept proposal (not to exceed 2,000 characters) Describe roughly what you plan to install and type of location. If you have a specific site or options in mind, please provide a detailed description of the street location and preference reason. Describe the methods and materials you plan to use in the installation. The Office of Arts & Culture is committed to reflecting the diversity and cultural richness of our city in the selection of artists and artworks. Artists will be selected on the basis of the following criteria: the artist’s suitability for this project, as indicated by the proposal, strength and artistic vision of past works or the potential for the artist to create artwork in public, and creativity of approach. The selection process will include a review by a peer panel and advisors who will review all interested roster applicants’ proposals and materials. Up to four artists will be recommended for commissions. Applicants will be notified of the panel’s decision by e-mail by late November 2016. The Office of Arts & Culture reserves the right not to select any of the applicants. Please contact Elisheba Johnson at elisheba.johnson@seattle.gov or call (206) 684-0182. For assistance with the CaFE online application process, contact CaFE tech support at (888) 562-7232 or cafe@westaf.org, Monday-Friday, 7:30 a.m. to 4:00 p.m. Pacific Standard Time.